Speed demon Brad Nolan has continued his rise to the top in motocross after claiming victory at the Kensworth Motocross Championship. 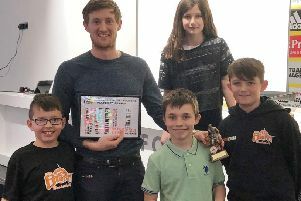 In his final year competing on a 65cc bike, the 11-year-old also finished sixth in the fiercely competitive GoldenTyre GT Cup National Series. This year, Brad moves up to an 85cc TM motocross bike and will be competing in a number of different championships, including the GoldenTyre GT Cup Nationals. He will be taking part in the TM of Nations, where he will be competing against other TM riders from around the world. In addition he will apply as a wildcard into the Michelin Nationals and the British Youth Motocross Nationals, along with competing in a club championship. Brad started at Longdean School in September and has received excellent support from his headmaster Mr Cunningham and PE Teacher Mr Mellor – both are very keen for Brad to progress and continue working towards his motocross goals. Brad has been lucky with sponsorship this year and, in addition to his sponsors Chris Osborn at Hi-Tech Express, Moore’s Motorcycles of Hemel Hempstead, Allease Aylesbury and Dannys Dirtbike Store, he has also received backing from Malcolm Rathmell Sport, CNRT Same Day Couriers and Forkshrink.com. Sportspace Hemel Hempstead have also offered Brad the use of the gym facilities to keep up his fitness.